Are you a gamer? Are you beyond ridiculously good at it? Are you female? Then you have the opportunity to join some of the best female gamers on the planet, the Frag Dolls. They are accepting applications up until July 23, 2012. The applications that they receive will be thoroughly looked at and the lucky girl that gets the position will get a job with UbiSoft works with the Frag Dolls doing marketing and participating in nation wide tournaments. Interested? 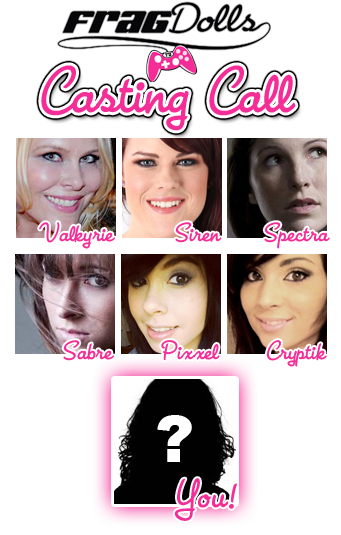 Then head to the Frag Dolls Casting Call page, and don't put this off. Want more information? Check the full press release after the break. SAN FRANCISCO – July 11, 2012 – Ubisoft’s Frag Dolls have announced their open casting call – a nationwide search to find a female gamer with the skills, drive, and personality to join their elite, professional gaming squad. Aspiring candidates may begin applying today by following the guidelines on the Frag Dolls Web site, www.fragdolls.com, until July 23, 2012. Applicants will be narrowed down to one proven gamer girl who will land a job with leading game publisher, Ubisoft, as the next Frag Doll. She will work alongside the rest of the team by doing Marketing and Promotions, working at industry events around the country, and competing in some of the latest and greatest competitive multiplayer titles. Applicants must live in the U.S., be at least 18 years of age and are required to submit their resume and gaming history for consideration. For more information about the Frag Dolls and the application process, please visit www.fragdolls.com. The Frag Dolls are a team of professional female gamers recruited by Ubisoft to promote their video games and represent the presence of women in the game industry. These gamer girls play and promote games at industry and game community events, compete in tournaments and participate daily in online gamer geek activities. Started in 2004 by an open call for gamer girls with competitive gaming skills the Frag Dolls can be found online or offline playing a variety of videogames in every genre, from RPGs and point-and-click PC adventures to FPS on the Xbox 360 and PC. Each week they write blogs about events, news in the industry, and their experience as gamers. You can find them online during regularly scheduled times, or talk with them in their community forums or their social networking pages on Facebook, YouTube, and Twitter. Ubisoft is a leading producer, publisher and distributor of interactive entertainment products worldwide and has grown considerably through a strong and diversified line-up of products and partnerships. Ubisoft has offices in 26 countries and has sales in more than 55 countries around the globe. It is committed to delivering high-quality, cutting-edge video game titles to consumers. For the 2010–11 fiscal year Ubisoft generated sales of 1.039 billion euros. To learn more, please visit www.ubisoftgroup.com.